In a previous section we distinguished between passive (or downhill) and active (or uphill) transport of uncharged molecules. The sole criterion for this distinction is the relation between the direction of the net movement of the molecule and the direction of the concentration gradient. If an uncharged molecule moves or is transported from a region of higher concentration to one of lower concentration, the transport process is said to be passive (or downhill) because the flow is in the direction of the driving force and thus can be attributed entirely to the thermal energy prevalent at any ambient temperature. Conversely, if the molecule moves or is transported from a region of lower concentration to one of higher concentration, the flow is termed active (or uphill) because thermal energy alone cannot account for this movement, and additional forces must be involved. The distinction between active and passive transport of ions is slightly more complicated because both concentration differences and electrical potential differences can provide driving forces for the diffusional movements of charged particles. This important point may be clarified by the following example. Consider the movement of K+ across a membrane separating compartment o from compartment i (see Fig. 3) under the following conditions: (1) the concentration of K+ in compartment o is 0.1 M; (2) the concentration of K+ in compartment i is 0.2 M; and (3) compartment i is electrically negative with respect to compartment o by 60 mV. Thus, the chemical force acting on K+ is a twofold concentration ratio tending to drive K+ from compartment i to compartment o. The electrical force acting on K+ is a 60-mV electrical potential difference tending to drive it from compartment o to compartment i. As we noted previously, a 60-mV electrical potential difference is equivalent to a tenfold concentration ratio; thus, in this example, the electrical driving force exceeds the chemical driving force, and K+ will diffuse from compartment o to compartment i spontaneously, even though the direction of net movement is against the concentration gradient. Now, using Eq. 11, we can determine the direction in which an ion will diffuse in the artificial system illustrated in Fig. 3, knowing the concentrations of the ion in compartments o and i and the electrical potential difference across membrane Vm, where Vm is the electrical potential of compartment i with respect to that of compartment o. Let us illustrate this point by considering some examples. Example 1: Co = 10 mmol/L; Ci = 100 mmol/L; z = + 1; and Vm = —60 mV. Substituting these values into Eq. 11, we obtain Et = 60 log(l/10) = —60 log(10/l) = —60 mV. Thus, the force of the tenfold concentration ratio which is driving the cation to flow from compartment i to compartment o is equivalent to 60 mV. But, at the same time, compartment i is 60 mV negative with respect to compartment o and this force tends to ''hold'' the cation in compartment i. Thus, the net force on the cation is zero, and there will be no net movement across the membrane in either direction. The system is at equilibrium. 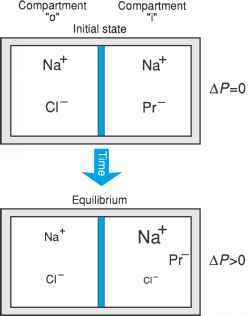 In short, when Ei = Vm, the chemical driving force arising from the concentration difference (ratio) across the membrane is exactly counterbalanced by the electrical driving force across the membrane, and there will be no flow. Example 2: Co = 5 mmol/L; C\ = 100 mmol/L; z = + 1; and Vm = — 60 mV. Now, from Eq. 11, Et = —78 mV. Thus, the chemical driving force for the flow of i from compartment i to compartment o is 78 mV, but the electrical holding force is only 60 mV. Thus, i will diffuse across the membrane from compartment i to compartment o. Example 3: Co = 20 mmol/L; Ci = 100 mmol/L; z = + 1, and Vm = —60 mmol/L. In this case, Ei = —42 mV. Thus, the chemical driving force tending to push i from compartment i to compartment o is less than the electrical driving force tending to pull the cation from compartment o to compartment i. The net result will be the diffusion of i from compartment o into compartment i despite the fact that this flow is against a concentration difference. In summary, an uncharged substance is said to be actively transported if net movement is directed against a concentration difference. An ion is said to be actively transported only if its net movement is directed against a combined concentration and electrical potential difference; flow of an ion from a region of lower concentration to one of higher concentration is not by itself inconsistent with simple diffusion. The Nernst equation permits us to determine whether the movement of a charged solute is passive or active. where we define Jt as positive when the flow takes place from compartment o to compartment i; thus, when Ci > Co, the flow is from compartment i to compartment o and is negative. For an ion, Jt is determined by the permeability of the membrane and the total electrochemical driving force. Now, it is often convenient to express Ji as a current given by It = zFJi: where zt is the valence of the ion, and F is the Faraday constant, which has the value of 96,500 coulombs (C)/mol. Thus, if Ji is in units of moles per unit area per unit time (e.g., mol/cm2/hr), then It = ztFJi is in units of C/cm2/hr. Because electrical current flow is given in amperes, which is in units of C/sec (i.e., the amount of charge flowing per second), Ii is in units of amperes per unit membrane area, or A/cm2. where the total electrochemical driving force is V - Ei (analogous to ACi for an uncharged particle), which takes into account the two forces acting on the charged particle, and Gi is the conductance of the membrane to i (the inverse of the resistance of the membrane to the flow of i) and is analogous to Pi. Equation 13 has the form of Ohm's law (i.e., I = GV), which, as discussed above, has the same form as Fick's (first) law of diffusion, which relates the rate of diffusion of an uncharged solute to its driving force.